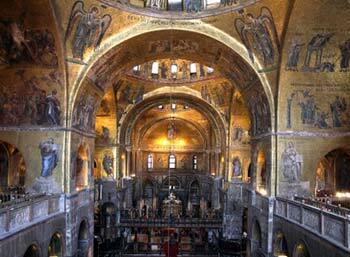 ABOVE: The gilded mosaic interior of St. Mark's Basilica. The cathedral's exterior is a riot of Byzantine architecture, with five domes and more decoration than a nouveau riche wedding cake; the interior is spectacular, with gold mosaics that come to life from 11:30 a.m. to 12:30 p.m., when the church is illuminated. Entrance to the Basilica is free, though it's polite to leave a donation. You'll need to buy tickets if you want to visit the San Marco Museum, the Treasury, and the Golden Altarpiece. For visitor information, click the article link below. Top photo copyright © Danin Tulic.